Toronto Inspires when three artists’ distinctive perspectives on barriers, real or otherwise, seamlessly dovetail into a cohesive exhibition that delivers heart, politics and whimsy. Offence/Defence is a dynamic examination of our relationship with fences and their demarcation of the territory between “us” or “them”. These complex ideas are presented in the abstract through works that are easily relatable to everyday experience, yet simultaneously provide a variegated analytic framework from which we can (re)consider our own relationships with and responses to barriers. 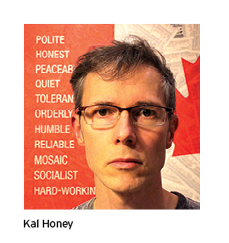 Kal’s 20-year background as a graphic designer underpins his current artistic practise that combines utilitarian materials and a bold sensibility. His works are frank and meticulously hand-crafted, with a manufactured precision. Often, they are embedded with levity. Like many of us, he has mixed reactions to fences, understanding the comfort of privately chilling in one’s own fortified backyard, without feeling the possible obligation of polite chit chat. Conversely, he recognizes the community building aspects of open gardens or hip-high separations that encouraged neighbourly engagement common to his parents’ generation. 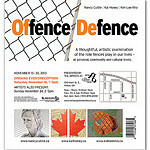 His works explore this kind of dichotomy through external manifestations: fences, by-law signs and a flag. 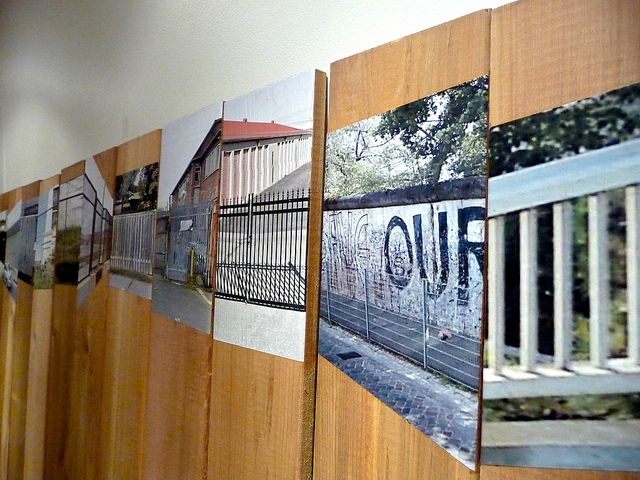 Spanning the lion’s share of the gallery’s backwall, Neighbours, the largest of Kal’s eight pieces, is a collage on cedar fence boards and specifically questions at which point does an ordinary fence get escalated into something more ominous. Bursting through the drone of opening day gallery chatter is Kim’s exuberant, easy laughter. She describes herself as a heart-based person, whose perspective is composed through the filter of feelings, hers and other people’s, light and dark. She often delves into themes of containment and the struggles against them, drafting into service any medium that will give form to her ideas. She cites her concern about the global effect of barriers and how nomadic peoples and migratory species are severely affected by the constant ongoing fracturing of what used to be open pathways, which previously allowed for the travel necessary for the species to survive. Here her work is more personal, at times visceral, and meant to be deeply expressive. Her ten pieces probing our relationship to fences and other barriers strikes intimately and emotionally close to the bone. Being crisp, clean, and contemporary, her work has an attractive aesthetic, an ornamental quality, but as you look beyond the digitally-printed polyester fabric of a piece like Comfy, the raw, emotionally honest images of distorted flesh evoke the conflicting effects of internal and external barriers. The artistic representation of skin stands in for your skin and mine skin; and draws empathy from its audience. With Insubstantiated, she deconstructs barriers by bringing you into the domestic realm through a sculpture combining paint pen drawing on polyester voile fabric, a hanging rod, and indoor/outdoor carpet. 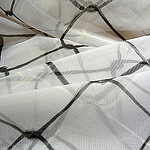 “Looking at the fabric you know how light it would be and how yielding, and yet it has chain link on it.” She takes this solid unyielding barrier of chain-link and transforms it into something that is soft and accommodating. 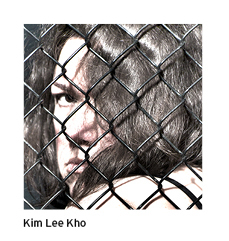 Home Bound reflects Kim’s particular friction with the positive and negative aspects of home ownership and the barriers to freedom that may be part of the package that comes with the proverbial white picket fence. 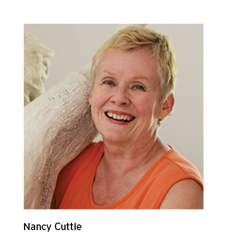 Sculptor and arts community activist Nancy Cuttle could be considered the progenitor of Offence/Defence. 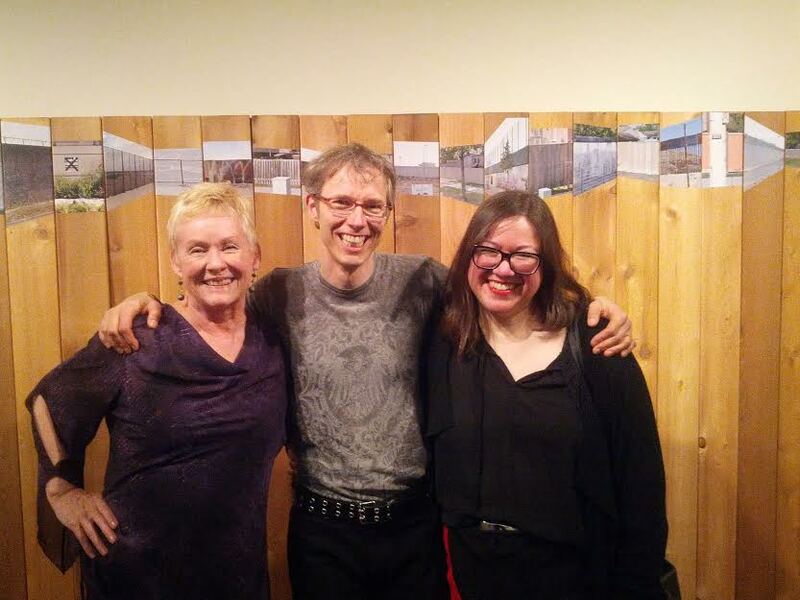 Not only was she the catalyst that united these three artists and provided the idea of fences as an initial point for artistic convergence, she was an instrumental force behind the development of the gallery space in which the exhibition is housed. FENCED is Nancy’s single, yet powerful, contribution to the show (best experienced in person than through a photograph). The 12ft x 12ft x 6ft winterstone, wire and wood sculpture installation (FENCED) prompts reflection as to how we can reject or submit to barriers. 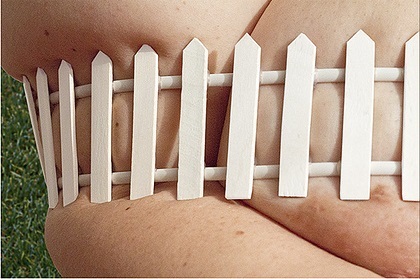 A series of life-size winterstone people depict different responses to the same fence. One breaks through. Another is stymied by it. Yet another is running obliviously towards it. For Nancy, barriers might be race, colour, age, or technology; and how you react depends on which side of the fence you find or place yourself. Inspiration Takeaway: Art ignites conversations. This entry was posted in Inspiration and tagged activism, creativity by TOFan. Bookmark the permalink.